Climate Change, Capitalism, and Corporations: Processes of Creative Self-Destruction. Christopher Wright and Daniel Nyberg. Cambridge University Press. 2015. Climate policies are rooted in the commonplace assumption that we can have economic growth without causing dangerous climate change. From this perspective, it is misguided to think of climate change as either a right-wing or left-wing issue — climate change can be addressed within existing neo-liberal assumptions about the good life. Consequently, the only responses to climate change which get a look in are those which require no compromise on the behalf of corporate profit-seeking activities. 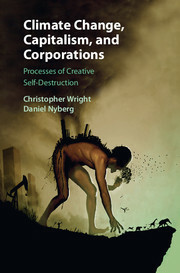 In Climate Change, Capitalism and Corporations: Processes of Creative Self-Destruction, Christopher Wright and Daniel Nyberg show how businesses have successfully created a climate change narrative that legitimates ensuring corporate interests remain the primary consideration in climate policy. The authors differentiate their book from previous accounts of the corporate destruction of the planet through the use of extensive research into the practices, policies and strategies of major businesses. They use this research to show a). how corporations have married different ‘orders of worth’ to construct climate change as a problem of calculable risk; b). the narratives employed by corporations to marginalise other narratives; and c). how corporate employees have drawn on different orders of worth to justify their role in delivering destructive corporate strategies. A core message of the book is that corporate constructions of climate change are narratives or myths which, in order to protect the destructive activities of corporations from sustained challenge, seek to shape the broader political and social context in which corporations operate. This means ensuring that the ideology of market expansion and economic growth is recognised as the correct and only solution to all humanity’s problems, including climate change. The maintenance of this myth requires corporations to be proactive in political lobbying and philanthropic activities to ensure the market narrative maintains its legitimacy. Chapter Three provides a useful analysis of the role that the ‘risk’ frame plays in achieving this outcome. The corporate narrative is so compelling because its employment of a cost-benefit analysis offers the promise of keeping the climate change monster at bay through a painless trade-off between commensurate priorities, each reduced to a particular economic value. This chapter breaks down the challenges posed to businesses by climate change into physical risk, regulatory risk, market risk and reputational risk. The authors explain how the risk frame has underpinned the commodification of carbon by making carbon measurable, exchangeable and comparable. Complex interdependent ecological processes are thus reduced to the atomised chemical component to be traded. Chapter Four extends the argument laid out in Chapter Three by examining the hegemonic goals fulfilled by corporate constructions of climate change risk. The actions that corporations have taken to shape the political agenda date back to the 1980s when corporations formed the Global Climate Coalition (GCC) to forestall any regulatory initiatives on carbon emissions in the USA. The results of the GCC’s efforts have been, in the authors’ words, profound. Whilst some more moderate corporate voices began to appear in the mid-2000s, the global financial crisis of 2008 saw climate change denial and indifference once again shape the political discourse of many Western democracies. Corporations such as Exxon-Mobil had a key role in shaping US climate policy around this time, whilst mining and fossil fuel interests were the dominant actors in shaping Australian climate policy. Corporate influence has extended to include NGOs, civil society organisations and conservation groups, all with the goal of shaping the debate and giving corporations a voice in determining what kind of future it is possible to imagine. The result of these narratives is the construction of a certain subjectivity that limits the role of the citizen to that of a politically inert green consumer. Taking action, doing something, playing one’s part — it is possible to assuage our climate anxieties by buying products with the word ‘eco’ somewhere in their title or product description. As someone with a more determinist and structural approach to the analysis of climate change policy, I did not find the interviews with corporate actors completely compelling or illuminating. Some of the quotes taken from interviews are affirmations of the principles of corporate risk management strategies spelled out in the accompanying text. However, the quotes are taken largely from senior executives at major corporations, and the interviewees tend to avoid saying anything particularly controversial or revealing. Other quotes come from interviewees trying to square their position as executives in large corporations with their sense of themselves as good people. However, it is the job description that defines what needs to be done. The stories the employees tell to make themselves feel good about what they do have limited explanatory power and contribute little to a systemic analysis. Anyone not fulfilling the requirements of the job description would be unlikely to be in the role in the first place, so personal narratives are largely irrelevant in this context. Therefore we are left with self-serving justifications which do not advance the debate in any substantive manner. I was also struck by how the authors avoided problematising the foundational myth of corporate climate change narratives: namely, the idea of a single, knowable dangerous limit to climate change. They mention the 2C limit. But they do not address how it is used to construct climate change as a problem solvable by modernity, rather than being one of its symptoms. There simply is no story for corporations to tell without that target. Once you have some abstract, yet-to-be-breached limit that is used to separate good from bad, then corporate and other actors are free to develop ‘working towards’ and ‘we are starting to see’ type fables. The possibility space for doing nothing while building the hegemonic alliances that allow for business as usual is utterly dependant on the global targets regime. What stories could we tell about climate change if there wasn’t a dangerous limit? None. That said, this volume offers a well-structured, thoughtful and detailed analysis of corporate strategies on climate change. It deserves to be a point of reference for all researchers and communicators engaging with this topic. I hope someone can produce a companion volume, explaining how the state in Western democracies has sought to help corporations achieve their goal of delaying effective action on climate change mitigation.